Researchers from the AMC, VU University Amsterdam and Radboud University have discovered four genes that play a role in the use of cannabis. An article about their findings, co-written by colleagues from the USA and Europe, is being published in this week's Translational Psychiatry. The research involved almost 40,000 participants in 17 different studies, who together make up the 'International Cannabis Consortium'. One in every four Dutch people has used cannabis at some time in his/her life. While cannabis can be a fairly harmless drug for some, it can lead to mental and physical problems or even addiction in others. Previous research on twins showed that hereditary factors play a major role (accounting for 45%) in people's tendency to use cannabis. Until now, however, researchers did not know which genes were responsible. The researchers found four genes that showed a variation in cannabis users that was not seen in people who never use cannabis. "One of these four genes, NCAM1, was particularly interesting because previous studies had shown that it also plays a role in nicotine addiction," say researchers Prof. Eske Derks (AMC) and Prof. Jacqueline Vink (Radboud University). NCAM1 plays a role in the transfer of dopamine in the brain. This hormone, which gives people a sense of reward, plays an important part in addiction. They now have to find out whether this applies to cannabis too. The researchers also revealed that the genetic risk factors for cannabis use largely overlap the risk factors for nicotine use. The discovery of these four genes gives insight into the biological processes governing cannabis use. 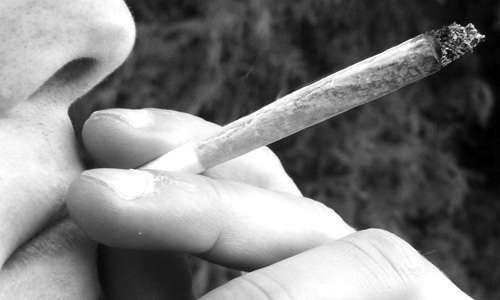 Further research will focus on how the genes affect cannabis use and whether they play a role in addiction.